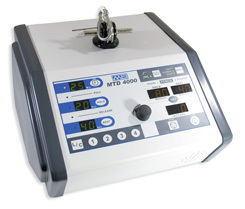 The MTD 4000 (Mettler Traction Decompression) system is an easy to use device that offers static and intermittent traction with user definable hold, rest, and treatment times. It gently pulls the cervical spine or lumbar spine in opposite directions to draw the soft tissue around the cervical or lumbar joints and separate the distance between bone sections of the vertebra. Maximum Output Force: 90 Kg / 198 lbs. Active displays show all treatment parameters and progress. Q: Can the MTD 4000 be used for decompression? A: Yes, the MTD 4000 is a traction/decompression device. Q: Will the MTD 4000 mount on my old traction table? A: The MTD 4000 was designed to fit most every table platform. As long as the table has a pedestal mount currently on it, the MTD 4000 will most likely fit. Q: Can I store my own protocols on the MTD 4000? A: The MTD 4000 has the capability to store up to ten custom protocols. Q: What is the maximum force of this unit? A: The maximum force is 90 Kg / 200 lbs. Q: Are there adjustable speeds on the MTD 4000? A: Yes, the MTD 4000 has 3 speeds to choose from. Slow / Medium/ fast. Q: Is the MTD 4000 a complete traction system including a table? A: No, the MTD 4000 is a portable traction head. It is not sold with a table.